﻿Pentecost: Calendar, History, Tweets, Facts, Quotes & Activities. Pentecost commemorates when Jesus sent the Holy Spirit to be with the disciples (Acts 2). With the Holy Spirit among the disciples, the church was born. Pentecost is a Christian festival that celebrates the gift of the Holy Spirit. The day used to be known as Whitsun, a Christian holiday. The festival is generally full of good spirits. Ministers will wear red robes as a symbol of the flames in which the Holy Spirit came to Earth. Symbolism is important on the day. The Holy Spirit is the third part of the Trinity (Father, Son and Holy Spirit) which Christians use as a way to interpret God. In essence, Pentecost is the birthday of the Christian faith. The holiday takes place on the Sunday 50 days after Easter. Today, Pentecost is not widely celebrated as a religious day, instead a secular public holiday gives workers in many industries the day off. 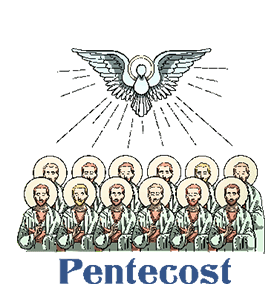 The name Pentecost comes from the Greek pentekoste meaning fiftieth. This year Pentecost falls on 15 May. Red is the color of Pentecost. Churches will be decorated in crimson (deep red color), and people sometimes wear red to signify the day. The color comes from the flame that scripture says appeared above the heads of each of the disciples (Acts 2:3). In the Roman Catholic tradition, Pentecost is sometimes called Whitsunday (pronounced: 'with - Sunday'). The name comes from the white color of garments that people wore who were being baptized typically wore. The Holy Spirit, often depicted as wind or a dove in the Bible, is the third part of the Christian Trinity, which also includes the Father, God, and Jesus Christ, the Son. The Holy Spirit is also referred to sometimes as the Holy Ghost. Some churches in the U.S. hold confirmation on Pentecost. Confirmation is a designation given to youth that bestows upon them responsibility for their own faith. Watch a documentary or film with religious undertones. There are plenty of films that examine religion, especially the Christian church. Pentecost (2011) is an Irish short film that was nominated for the Best Short Film at the 2012 Oscars. Pentecost is a particularly appropriate day to join a church. In the early church, it was a day when the newly converted, after a period of preparation, were baptized. Some churches stress mission around Pentecost. See what your local church is doing to help your community and get involved. Pentecost is a high holy day in the Orthodox Church. Attend night service on Saturday to usher in the holiday. Vatican.va: Homily of Pope Francis, Sunday, May 19, 2013.